I know things have been lagging around here a bit. So I've recruited my baker-friend extraordinaire Todd for a couple of guest posts (you'll remember Todd from his amazing Plum Cupcakes and Lemon-Filled Spice Cookies.) All the photos were taken by Todd's brother Seth, whom you can find at Seth Thomas Design. Thanks to the both of you! In mid-December, I stopped into Tipsy Parson in Chelsea, NYC for an afternoon snack to discover their Muffin of the Week was gingerbread with coffee icing. Gingerbread and coffee are two of my favorite things, so it was no surprise that I enjoyed it immensely — hardly willing to give more than a small bite to my brunch companion. 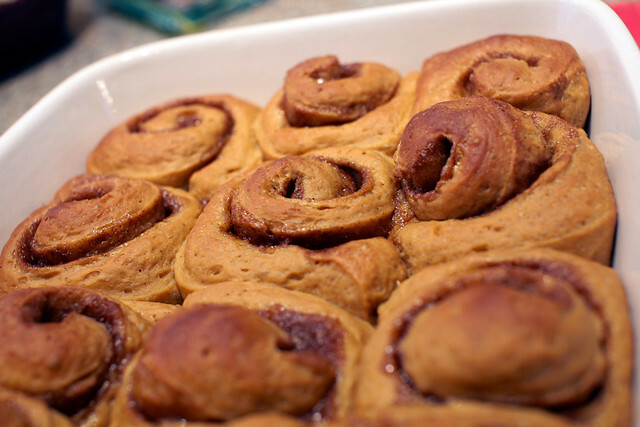 A week later, for Christmas Day family breakfast, I found the perfect chance to reincarnate the recipe in the form of a cinnamon bun. It was a great success! Andrea has been a wonderful friend over the years, but she's taken it to a new level by offering her Paris apartment to me for a week over this holiday break (OK, maybe I begged...) while she visits family back in the States. As I prepare to board an Air France flight, I doubt the pastry I'll encounter in Paris will beat these buns; They are seriously delicious. I think the beauty of this recipe is that with a simple addition of raisins, orange peel, chocolate, etc. 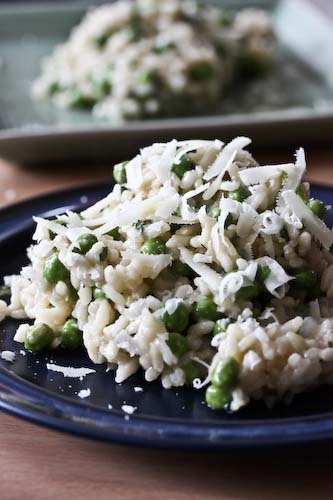 these could be a customizable holiday tradition for your family and friends. Before this project, I'd never dared take on yeast. I did find the time it took the dough to initially rise was longer than expected, closer to two hours rather than the one hour quoted in most bun recipes. I was (sort of) patient and placed the bowl on a warm stove top to facilitate the growth. Eventually I noticed there had been some rise, so I took the dough out and punched it down (this part was really fun!) to start the roll creation. 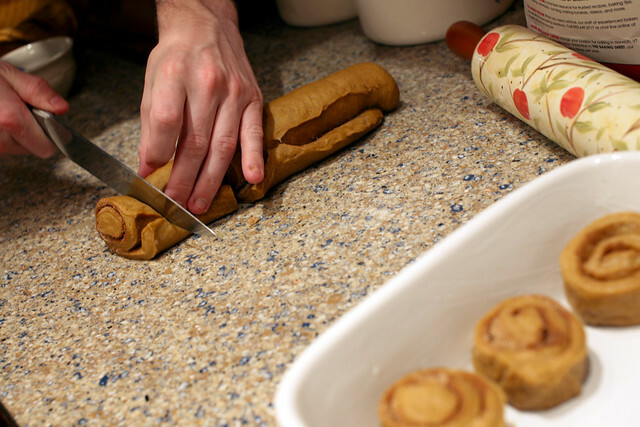 Once the rolls were cut and placed in the pan, I left them covered overnight before baking them in the morning-- leaving them for this period of time did not seem to do any harm whatsoever. I was concerned they wouldn't rise to twice their size, but uncovering them in the morning became a moment of glee as they were much fuller than I had expected. 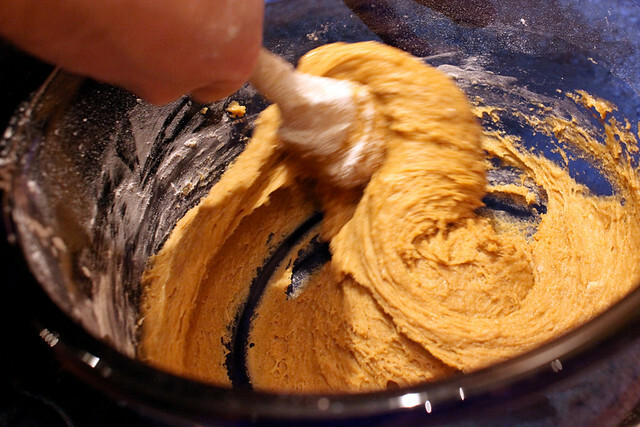 In a large bowl or bowl of a stand mixer, whisk yeast with 1/4 cup warm water. Let stand 5 minutes. Stir in milk, molasses, brown sugar, cloves, egg, oil and salt. Stir in 1 cup flour, use paddle attachment with dough hook (if not mixing by hand as I did). 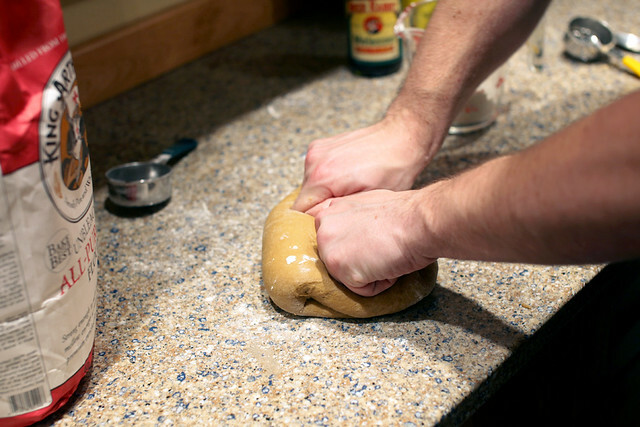 Add enough flour until dough pulls away from sides of the bowl (you may not use all the flour). 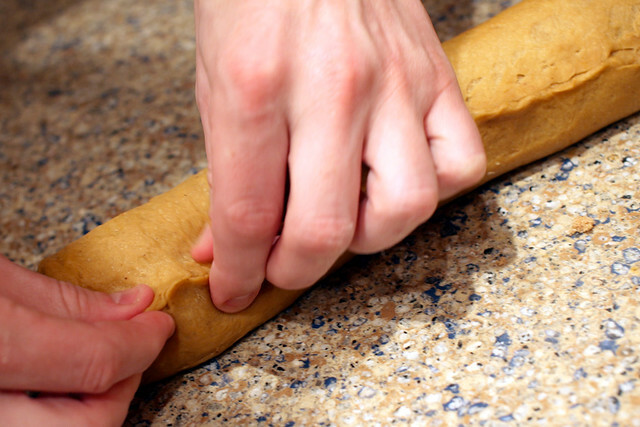 Increase speed to medium and knead for 5 minutes, adding 1 tablespoon flour at a time as necessary until you end up with a smooth, elastic dough (you can also knead by hand on a lightly floured surface for 10 minutes until you end up with a smooth, elastic dough). Shape dough into a ball and place in a large, lightly greased bowl, cover with plastic wrap and let rise until doubled, usually 1-2 hours. 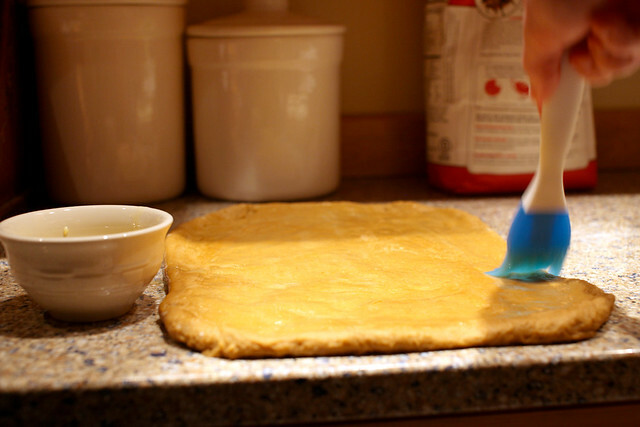 Punch risen dough down and place on a lightly floured surface. Cover and let rest 10 minutes. Grease a 13-by-9-inch pan and set aside. 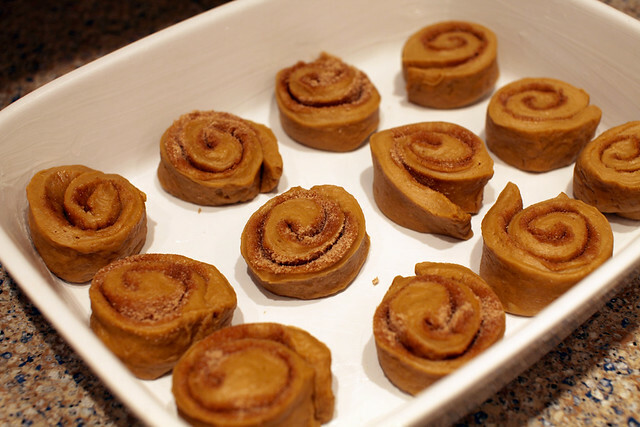 In a small bowl, whisk together brown sugar, sugar, cinnamon and ginger. 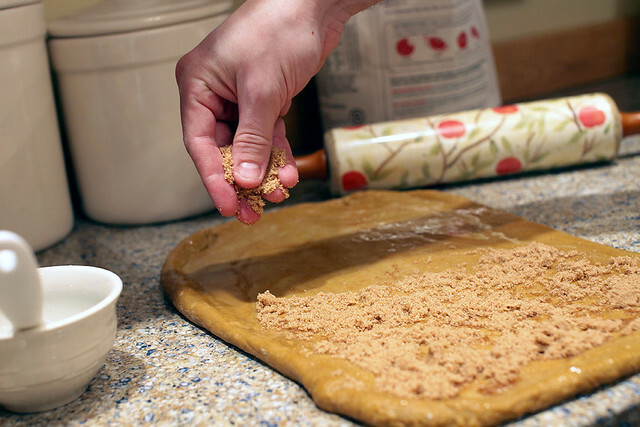 Roll dough out into a 12-by-8-inch rectangle and brush melted butter on top of dough. 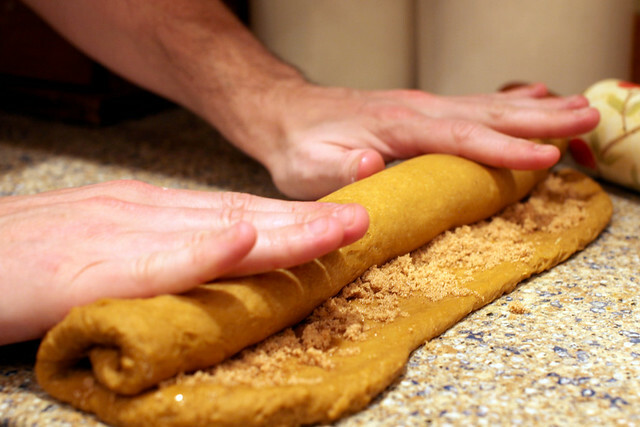 Sprinkle evenly with brown sugar mixture and roll up tightly from the long end, pinching to seal. Cut log into 12 equal pieces and space evenly in 13-by-9-inch pan. Cover and let rise until doubled, about an hour (I let mine sit overnight). Preheat oven to 350 degrees F. Uncover risen rolls and bake 20-25 minutes until puffed and golden brown. 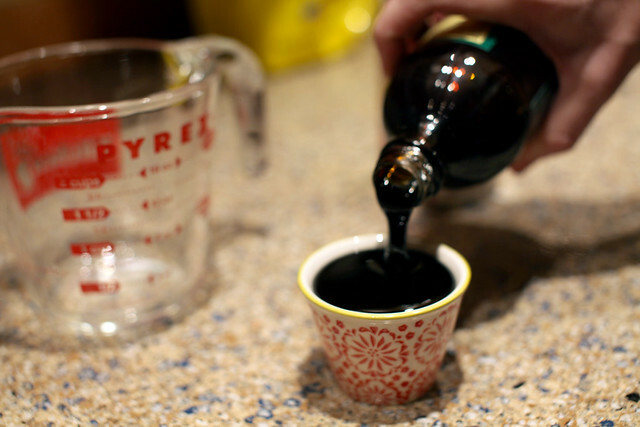 In the meantime, make your glaze: Whisk together powdered sugar, cinnamon, vanilla extract, coffee, and enough milk to make a thick but drippy glaze. Remove rolls from oven and let cool 5 minutes before drizzling with glaze. Serve warm. Oh my gosh, I love gingerbread. 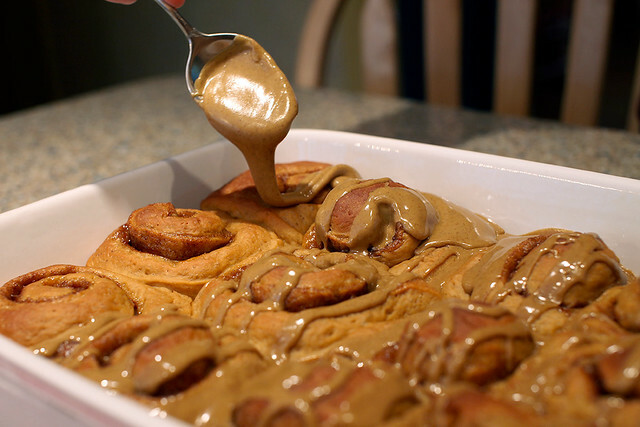 That is one awesome idea for cinnamon rolls. 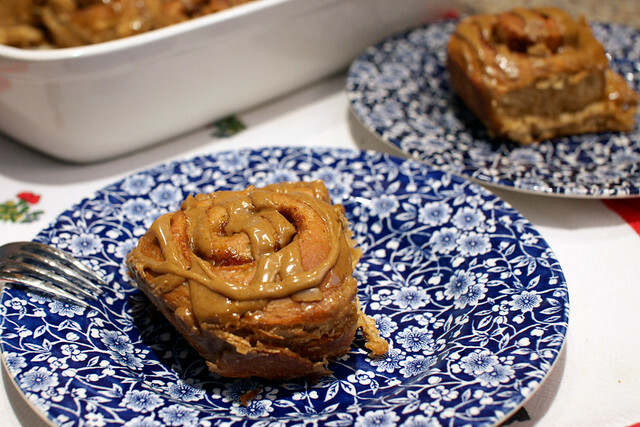 I have a sweet treat linky party going on at my blog and I'd love it if you'd come by and link your rolls up. http://sweet-as-sugar-cookies.blogspot.com/2011/12/sweets-for-saturday-50.html. It'll be open till Monday night. 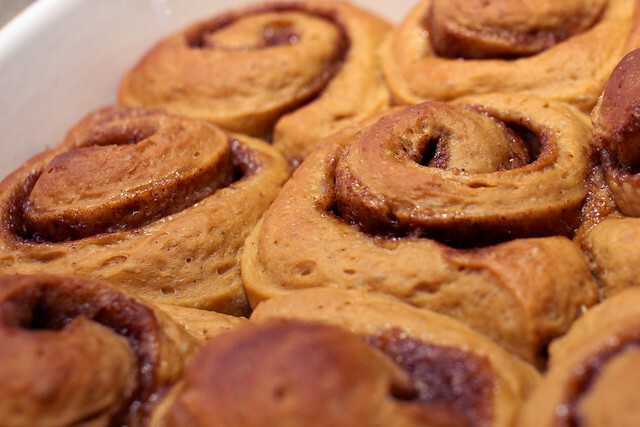 These rolls look fabulously delicious! One thing I can give you for advice though is use regular unwaxed floss to cut the rolls perfectly. 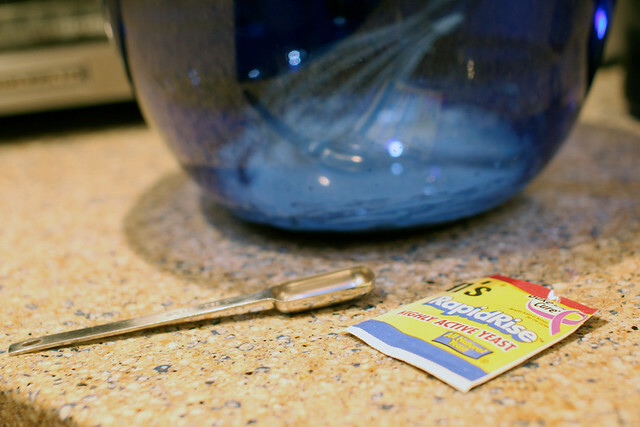 Just put it underneath, then pretend like your going to tie a bow but tight and ya slice right through it. No trying to hold it together! Amazing.